While this drop could be a precautionary step by investors and traders who don’t want to inconvenience and unable to cash out assuming there is a technical glitch preventing free withdrawal after the migration, the number of long positions is increasing, up 5193.5740 BTCs or 18 percent in the last two days at the time of press. Obviously, the drop in BTC shorts would logically be accompanied by a drop in long positions ahead of the schedule. However, that is not the case. Needless to say, it is likely that increasing BTC longs point to increasing demand. Despite the withdrawal of liquidity during maintenance, traders stand to profit if they hodl after transferring their BTC stash to wallets whose private keys they have control of. At the time of press, BTC is firm and trading above $4,000. It is up 5.4 percent against the USD in the last day and seems to be breaking off consolidation in lower time frames triggering lower time frame long positions. 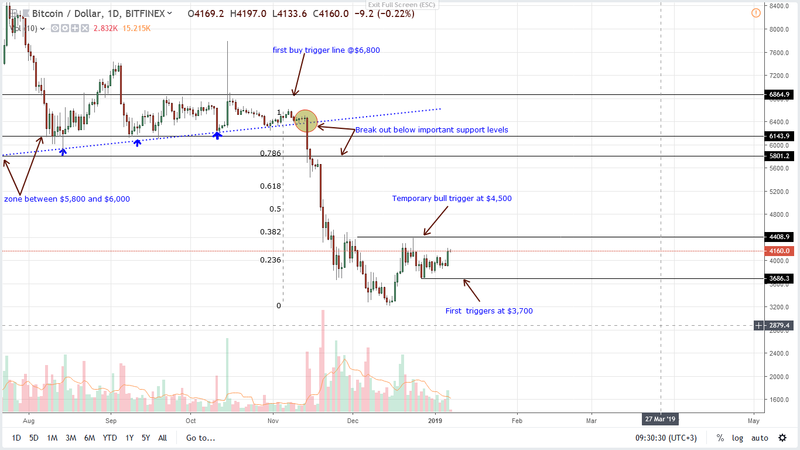 Still, conservative traders ought to take a neutral position until after there are sharp, high-volume gains above $4,500 solidifying our previous stance while opening doors for $5,800 and $6,000. Market participants are positive and with Bakkt roll out on the cards, BTC can easily print $6,000 or higher. Nevertheless, candlesticks point to a different ball game. From a top down approach, it is clear that sellers are in control. However, take note that this could be a normal retracement in a trend dominated by bears. When we paste a Fibonacci retracement tool between Nov-Dec 2018 high low we realize that BTC liquidation is at the $4,500—or the 38.2 percent retracement level. More often than not and has history show, asset prices tend to resume dominant trend from this level. Therefore, it is of prime importance that bulls—if they are indeed in control, closes above $4,500. Ideally, this should be at the back of above average volumes reasserting their presence and nullifying bears of mid-Nov 2018. If not and prices drop today, BTC may see $3,500 or lower by end of the month. The ecstatic sells of Nov 20 marked the end of high volume bars. As we can see from the charts, trading volumes are tight and with it trading ranges are low and accumulating. Ideally and as reiterated in previous trade plans, $4,100 and $4,500 are important trade levels. If bulls are in control then breakouts should be accompanied by high volumes above those of Nov 20—117k versus 37k. At current volumes averaging 17k, it’s a long short but nothing can be discounted considering how the space is volatile.